An unusual numberplate spotted in Dublin. Michael Healy-Rae has asked the government to consider changing numberplates next year, allowing motorists buying new cars to avoid having '13' on their plates. 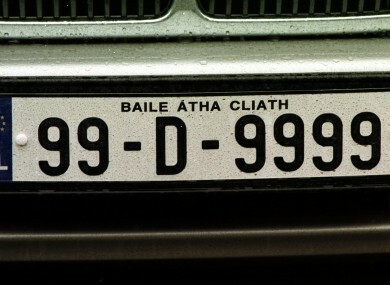 AN INDEPENDENT TD has urged the government to consider amending Ireland’s car registration plate system for next year – because some superstitious motorists do not want cars with ’13′ on the plates. Michael Healy-Rae has called on finance minister Michael Noonan to examine the possibility of changing the registration plate system for next year, saying the move would benefit the motoring industry as a whole. “There’s people now who, we’ll say, always change their cars every two, three or four years,” Healy-Rae told TheJournal.ie. “Take you, for instance – you might be one of these men who change their car every three years, and 2013 is your year to change. “People like you are after going to the garages and saying they’ll wait until the next year” before replacing their cars, he added, simply because they did not want to drive cars carrying a number which is often thought to be unlucky. Healy-Rae said car deals had already approached him to raise their concerns, which in turn had been fuelled by remarks from prospective car buyers who felt it might be bad luck to drive cars with the number 13 on them. Alan Nolan from the Society of the Irish Motor Industry (SIMI) said the possibility of a superstitious drop in sales would hurt a sector that is already struggling. “You have to put this in the context of the market, which has fallen from around 180,000 new cars per year… this year we’re looking at 75,000 or so in new sales,” he said. Nolan said his society had been campaigning for an overhaul of the licencing system because it meant that the car trade was seasonal, with the majority of cars sold in the first quarter of the year. Ireland could follow the UK’s lead by adding a new identifier to numberplates on cars registered after July, he suggested, by simply putting an X on the numberplate to read ‘X12-D-123456′. Car dealers in certain areas had also experienced difficulty in car sales given how the county name on a numberplate cannot be edited afterward. Some Dublin-based dealers were reluctant to buy viable second-hand cars, Nolan suggested, because they carried a rural county – meaning they would be more difficult to sell to another buyer. The Department of Finance currently has no plans to change the registration plates, but says it is willing to consider proposals in advance of next year’s Budget when such measures would be formally enacted by the Revenue Commissioners. The fear of the number 13 – formally known as triskadekaphobia – is thought to originate from the Bible, as there were 13 people present at the Last Supper after which Jesus was crucified. A similar fear exists in Norse mythology, where Loki – seen as something of a devious ‘trickster God’, and who is said to have murdered another god – is the 13th god. Another theory suggests that 13 is a number suggesting chaos, and that the civilisations of Ancient Persia – who believed the twelve astrological constellations ruled the universe – feared the advent of a 13th constellation that would destroy humanity. It is common in team sports – and particularly in motorsport – for teams or clubs not to assign the 13 shirt or car number. The last time a Formula One car raced with the number 13 was in 1976. Email “Drop ’13′ from next year’s numberplates to save car industry, urges Healy-Rae”. Feedback on “Drop ’13′ from next year’s numberplates to save car industry, urges Healy-Rae”.